On the subject of jacking points, even if they are resolutely solid it is best not to use them. The Dolomite range is ideally jacked on the subframe at the front and the axle at the rear. If the shell is sound the jacking points are fine. As you said, it is less dangerous if up employ the subframe or axle, but that is true for most cars. 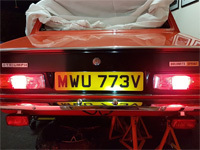 Post subject: Re: 1976 Triumph Toledo... 'MEL'...! My top tip for a jack pad is to use an ice hockey puck. They are basically thick rubber discs and very cheap and easy to get hold of. That is exactly what my good lady said and I totally agree...! I suppose (in a perverse way!) it is indeed a good thing as I'd have never discovered it otherwise. Anyhow, I can see myself drawing up quite a bit of a rust-list over the next few evenings...!!! A bit of rust on a near 40 year old motor...?! Never...!!!!!!!!!!!!!!!!!!!!!!!! Oh arse.. It all looks so solid too. I know the ends had gone, put a mirror and a torch down the end looked promising, re-enforcers where there (at least as far as i could see..) I'll cut along one of them and make a little window - have a peek inside. Unfortunately the sill structures on our cars rust from the inside out. The middle diaphragm section forms a water trap where it is joined along its lower edge. From the outside all can indeed look well. Since the ends are gone you can expect the worst I am afraid . I like the ice hockey puck idea! Hmmmmm I could do that! '72 Saab 99 1850 (Now rebuilding, slowly but surely! Also, reading an above comment about the states of sill ends fills me with dread too...!!!!!! Last edited by Toledo Man on Fri Apr 06, 2018 5:28 am, edited 1 time in total. Not a bad failure list at all. It's just easily replaceable suspension bits, really. Having not been on here recently I have just seen all my pictures have vanished...! DRATS...!!! I don't know whether that will be with me or with someone else but as the weather is now getting nicer I will drag it out of its hiding-hole and give it a scrub and see where we're at! It really doesn't look good as it is but things do look better when spruced up a tad don't they...?! I am loathe to part with it but I'm not technically skilled, I'm not flush with cash and I'd hate for it to never turn a wheel again as it's a little, sprightly joy! I've managed to fix most of the Photobucket links.